In addition to safe methods of working with materials there is a requirement to protect workers from falls. The Construction Safety and Welfare Regulations 1966 statutory no.1592 Regulation 6 states that it is the responsibility of the employer to ensure that any employee required to work at a height of 2 metres or more must be suitably protected from any potential fall hazards. The Construction Design and Management Regulations 1994 (CDM) extend the responsibility for Health & Safety to the designer. The designer must ensure that the design is such that it minimises risk during construction, maintenance and repair. Failure to comply with these requirements could ultimately lead to criminal as well as civil prosecution. Safe methods of access and working should be used for the roof installation and ongoing maintenance of the roof and any equipment on it. 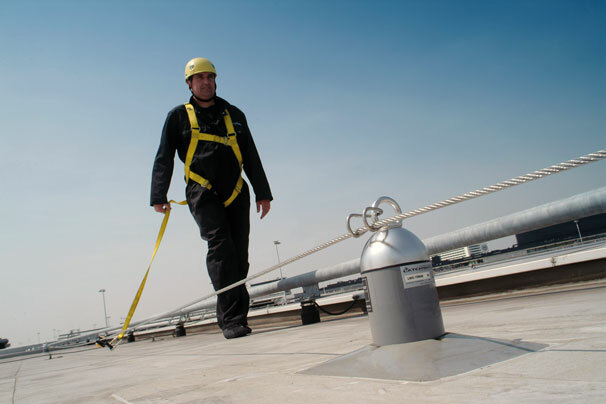 Prevention of falls is a major consideration and may require the use of edge protection or a safety cable system. If a safety cable restraint or fall arrest system is installed it should have been type tested to European Standard EN795 and carry the CE mark. The support posts for the system should be of suitable design to withstand the high potential loads and to allow adequate weathering.